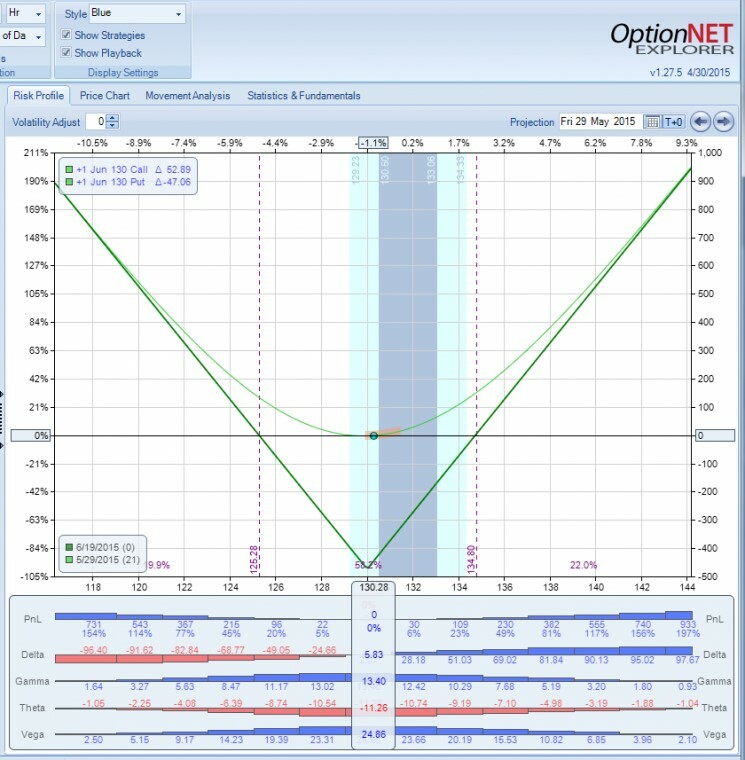 The following is a guest post from Kim Klaiman, full time options trader and founder of steadyoptions.com. The earnings season provides a lot of opportunities for active options traders. Some traders like to play earnings with directional bets, buying straight calls or puts. This is a very tough strategy. You have too many factors playing against you. Even if you are correct about direction, you need to overcome the Implied Volatility (IV) collapse that usually comes after earnings are announced. Others play it with non directional strategies like straddles or calendars, but hold the trades through earnings. Those strategies can definitely work, but they could also be very volatile due to unpredictability of earnings. Personally, I prefer to play earnings non-directionally. One of my favorite strategies is buying a straddle a few days before earnings and closing the position before the announcement to reduce the risk. 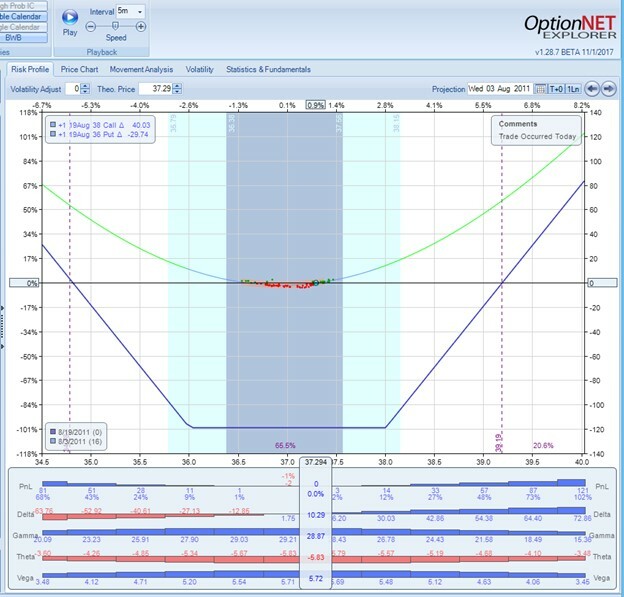 A straddle is a vega positive, gamma positive and theta negative trade. What does it mean? The theta is your enemy: all other factors equal, the trade will be losing value due to time decay. The vega is your friend: increase in IV (Implied Volatility) will help the trade. The gamma is your friend as well: stock movement in any direction will help the trade. The straddle makes money as follows: The stock has to move (no matter which direction) and/or the IV (Implied Volatility) has to increase. 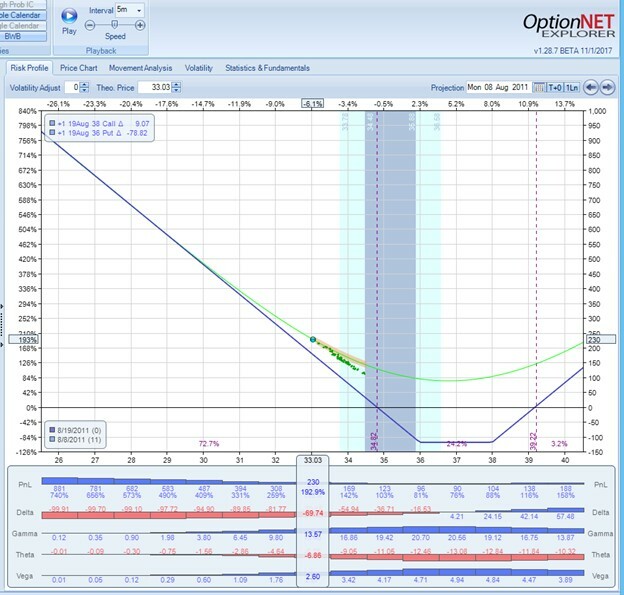 A straddle works based on the premise that both call and put options have unlimited profit potential but limited loss. While one leg of the straddle losses up to its limit, the other leg continues to gain as long as the underlying stock rises or falls, resulting in an overall profit. When the stock moves, one of the options will gain value faster than the other option will lose, so the overall trade will make money. If this happens, the trade can be closed before expiration for a profit. You execute a straddle trade by simultaneously buying the call and the put. You can leg in by buying calls and puts separately, but it will expose you to directional risk. For example, if both calls and puts are worth $5, you can buy a straddle for $10. If you buy the call first, you become bullish — if the stock moves down, the calls you own will decrease in value, but the puts will be more expensive to buy. Straddles are a good strategy to pursue if you believe that a stock’s price will move significantly, but unsure as to which direction. Another case is if you believe that IV of the options will increase — for example, before a significant event like earnings. IV usually increases sharply a few days before earnings, and the increase should compensate for the negative theta. If the stock moves before earnings, the position can be sold for a profit or rolled to new strikes. This is one of my favorite strategies that we use in our model portfolio for consistent gains. Many traders like to buy straddles before earnings and hold them through earnings hoping for a big move. While it can work in some cases, I don’t do it. The reason is that over time the options tend to overprice the potential post earnings move. Those options experience a huge volatility drop the day after the earnings are announced. In most cases, this drop erases most of the gains, even if the stock had a substantial move. This is the reason why we will always close those trades before earnings for whatever P/L we can get. There will be some rare exceptions, but in general, this is the rule. The IV increase is not enough to offset the negative theta and the stock doesn’t move. In this case the trade will probably be a small loser. However, since the theta will be at least partially offset by the rising IV, the loss is likely to be in the 7-10% range. It is very unlikely to lose more than 10-15% on those trades if held 2-5 days. The IV increase offsets the negative theta and the stock doesn’t move. In this case, depending on the size of the IV increase, the gains are likely to be in the 5-20% range. In some rare cases, the IV increase will be dramatic enough to produce 30-40% gains. The IV goes up followed by the stock movement. This is where the strategy really shines. It could bring a few very significant winners. For example, when Google moved 7% in the first few days of July 2011, a strangle produced a 178% gain. In the same cycle, Apple’s 3% move was enough to produce a 102% gain. In August 2011 when VIX jumped from 20 to 45 in a few days, I had a Disney strangle and a few other trades more than double. During broad market corrections, you can have very nice gains, as a result of both stock movement and IV increase. So the losses are usually very small, the winning percentage is around 70%+ and you get cheap black swan protection. Here is just one example using the August 2011 meltdown. Walt Disney (DIS) was scheduled to report earnings on August 9, 2011. With the stock trading at 37.30, you could buy a 38/36 strangle with expiration at August 19, 2011, ten days after earnings. That’s right, after the market was down double digits, the strangle value almost tripled. Of course those huge gains are not common. You need a severe market correction to get them. But for a strategy that produces stable 7-10% gains with very low risk, having this black swan protection in the portfolio is a huge added value. My typical profit target on straddles is 10-15%. I might increase it in more volatile markets. I usually don’t set a stop loss on a straddle. The reason is that the upcoming earnings will usually set a floor under the price of the straddle. Typically those trade don’t lose more than 5-10%. The biggest risk of those trades is pre-announcement. If a company pre-announces earnings before the planned date, the IV of the options will collapse and the straddle can be a big loser. However, pre-announcement usually means that the results will be not as expected, which in most cases causes the stock to move. So most of the time, the loss will not be too high, especially if there is still more than two weeks to expiration. But this is a risk that needs to be considered. Earnings straddles can be a good strategy under certain circumstances. However, be aware that if nothing happens in term of stock movement or IV change, the straddle will bleed money as you approach expiration. It should be used carefully, but when used correctly, it can be very profitable, without the need to guess the stock direction. Kim Klaiman is a full time Options Trader and founder of steadyoptions.com – options education and trade ideas, earnings trades and non-directional options strategies. Read more from Kim on his Options Trading Blog.